You are here: Home » Actueel » Online edition of the Clusius correspondence: Collaborate! Online edition of the Clusius correspondence: Collaborate! Huygens ING (KNAW) and Scaliger Institute (University Library Leiden) made a first big step towards the edition of the correspondence of the famous naturalist Carolus Clusius (1526-1609). This edition is being realized in eLaborate, the online transcription tool developed by Huygens ING. A beta version is now online for registered users. 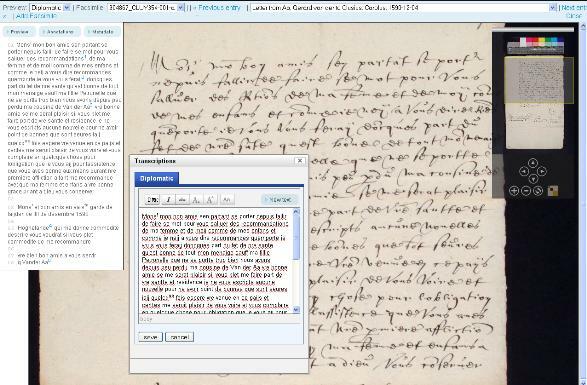 The site includes transcriptions of 450 letters that can be consulted, searched and improved. Moreover, the metadata of all known letters and the scans of 1300 letters in the University Library Leiden are included, in order to make new transcriptions possible. We (Esther van Gelder and the History of Science staff at Huygens ING) invite all scholars in the field of the history of science, students of languages and paleography, and anyone seriously interested in the history of botany, to join the project with new transcriptions, improvements of existing texts, or to conduct full text searches.